Also Called: Patagonian plantain, woolly indianwheat. Stems: Nearly stemless or .5 to 1.5 inch long from 2- to 4-branched caudex. Leaves: Alternate, basal, simple, ascending, linear-oblanceolate, 1 to 8 inches long, about 1/2 inch wide; veins 1-3; margins entire; surfaces woolly-hairy; tips pointed. Inflorescences: Spike, narrow, 1 to 6 inches long, densely woolly or silky pubescent, terminal on stalk 1 to 10 inches long; 1-20 spikes per plant. Flowers: Inconspicuous, densely crowded in spike; covering bracts triangular to linear, less than 1/10 inch long, progressively reduced above, woolly pubescent; petals 4, whitish; stamens 4, slightly protruding to included. Fruits: Capsule, opening near middle; seeds 2, boat-shaped, light brown, about 1/12 inch long. Habitat: Dry prairies, pastures, waste places, and roadsides; all soil types, but more abundant on sandy or rocky soils. Distribution: Throughout Kansas, but more frequently in west 2/3. Forage Value: A food source for birds and small mammals. Uses: Native Americans used a tea brewed from the plant as an appetite supressant and to treat headaches and diarrhea. They used the seeds for food. 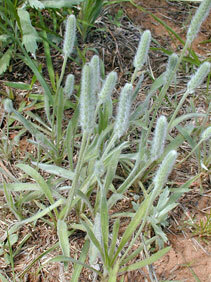 Comments: Woolly plantain is drought resistant. It is not a problem weed or a significant forage plant. The presence of woolly plantain can be an indicator of overgrazing. The pollen is thought to cause allergy symptoms.